A survey of members of The 5% Club has found that less than 2% of businesses are fully confident their employees are well placed to take advantage of the rising use of new technology. The 5% Club, an employer-led movement which includes Skanska UK Plc and Kier Group, works to create “earn and learn” skills training opportunities across the UK by driving the recruitment of apprentices, sponsored students and graduates. Lady Cobham CBE, director general, The 5% Club, said: “Over the next few years, businesses will face unprecedented change. The increasing use of Artificial Intelligence, data insight and other technological advances will become the expected norm for businesses in order to thrive and as such, we need to prepare our workforces accordingly. At the same time, we will see a growing, ageing population, working for longer and requiring their skills to be updated more regularly, either in existing jobs or when developing their careers. Underpinning this, is the ongoing skills crisis across sectors. Skanska UK Plc and Kier Group are both active members of The 5% Club who participated in its 5th birthday survey, and were positive about the potential of earn and learn programmes to address the issues facing today’s businesses. Skanska joined The 5% Club in 2015, shortly after setting up its emerging talent team. The company has over 5,000 employees and currently over 200 apprentices. Emerging talent manager, Martyn Scott, said: “Our industry has challenges around an ageing workforce, skills shortages in industry and also diversity and inclusion. On top of that the digital revolution is coming in to the industry and we feel we can move the needle on all of this using earn and learn initiatives. 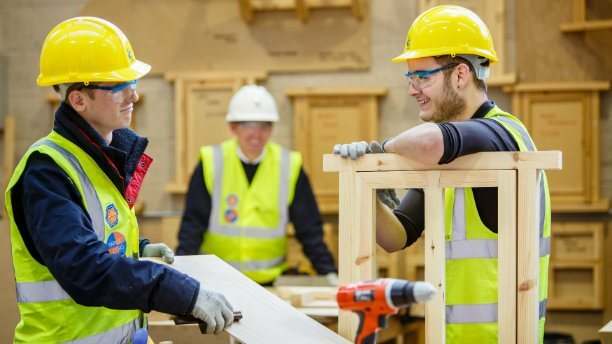 “We recruit apprentices from colleges and schools, and we also have older apprentices, and programmes for NEETs (‘Not in Education, Employment or Training’) and care leavers. The roles we offer range across the board from quantity surveying to HR, and construction management to digital engineering. Kier has been running earn and learn schemes for many years, and currently has close to 900 individuals on structured programmes to support their development. The group has over 50 different types of apprenticeships on offer, including digital construction, business administration and quantity surveying that covers a range of development opportunities from entry level to degree programmes. Katie Nightingale, Kier Group early careers manager, added: “Our industry is fascinating and rewarding and we must act now to attract more talented individuals to consider a role within the built environment. As our workforce evolves, we have a continuous focus on strategic workforce planning to ensure we have a vast array of programmes, including earn and learn opportunities, that creates pathways for all. “People are the life blood to the built environment and we are committed to investing in the workforce of tomorrow. Our approach is clear, we do not see recruiting new talent as an HR initiative, but a staple part of the group’s sustainable business growth strategy.